Renting a car in a city like Bangkok is quite easy. You can find places right at the airport, or even various offices spread throughout the city. Prices for a four-person vehicle aren’t terribly high, starting at 300 THB a day. Driving from Bangkok to Cha Am takes more or less two hours. The fastest route is Highway number 4. If you prefer to rent a taxi instead, it will cost you around 1,900 THB from Bangkok. From nearby cities, like Hua Hin for example, prices start from 500 THB. A much smaller alternative is the train. Click here to read our guide to trains in Thailand. From the central station in Bangkok (Hualampong) there are three daily trains heading for Cha Am. The first leaves at 9:20 a.m., and it’s an ordinary train so it makes all the stops. The other two trains leave at 3:30 p.m. and 6:15 p.m. respectively. Even though these two trains are called “fast” they take about four hours to get to Cha Am, just a little less than the regular train. A ticket is really cheap: for just 40 THB you can buy a seat in third class. Once you get to the station in Cha Am you should take a taxi. The train station is actually rather far from the middle of town. For 70-100 THB you should be able to take a tuk-tuk that will bring you right to your hotel. After taxis and cars, buses and minivans are probably the quickest most comfortable way of getting to Cha Am. Here you’ll find our guide on buses in Thailand. From Bangkok buses leave from both the Ekkamai station and Sai Tai station. In both cases the final destination will be Hua Hin. The trip takes about three hours, and tickets start at 130 THB for a seat on an non-air conditioned bus with fans. Up until September 25, 2016 minivans left from the Victory Monument station. Today though you take a minivan for Cha Am only from the South station (Sai Tai Station). It costs 160 THB a person. The disadvantages of taking a minivan are that drivers go at high speeds (so there’s a high chance of being involved in an accident); and the trunk for luggage is almost nonexistent, so if you have big bags you’ll be required to pay for additional tickets. To conclude, minivans stop along the way to get gas and allow passengers to use the restrooms or buy food. These 15 minute breaks often turn into an hour-long wait and the trip between Bangkok and Cha Am and vice versa (which usually lasts three hours), can become a six-hour trip, also counting traffic getting in/out of the Thai capital. Just as with the bus, minivans depart very early in the morning (around 5:00 a.m.), up until the evening (nothing after 8:00 p.m.). Tickets are available online on the site 12go.asia. In the beginning of 2017 a new sea route was launched: Hua Hin-Pattaya and vice versa. Thanks to the company Royal Passenger Liner, in two hours the ferry can move you from one coast to another without having to sit in a minivan for six hours. Ferries depart two times a day: at 10:30 a.m. from Pattaya, and 1:30 p.m. from Hua Hin. Ticket prices start at 1,250 THB a person for an economy class seat; 1,550 THB for first class. Tickets are available on 12go.asia. Once you get to Hua Hin you can take a taxi or minivan that will bring you to Cha Am in not even 30 minutes. An alternative way for getting to Pattaya from Hua Hin and vice versa, is the bus. It takes five and a half hours and costs 465 THB. In this case the route is offered by Bell Travel, and you can buy a ticket on 12go.asia. Buses leave from the north station of Pattaya at 11:00 a.m., and arrive at the new bus station in Hua Hin at 4:30 p.m.. From here you can take a bus, minivan, or a taxi for the center of Cha Am. In Cha Am there’s a little more than 170 hotels. There are offerings for all budgets, from simple guest houses to more sophisticated and comfortable hotels with pools and gyms. An interesting resort located right on the beach is the Golden Beach Cha Am Hotel. In the busiest times, like three day weekends or during the Thai New Year which is held in mid-April, it’s best to book in advance so as to be sure find a spot. During “normal” weekends, you could just go right there and negotiate the price of a room. Click here to read our reviews of the main hotels in Cha Am. The restaurants in town mainly offer Thai food. There are however a few exceptions like the Happy Pizza restaurant with an Italian menu, La Baguette with French dishes, and the Samba Steak House which offers Brazilian specialties. The beach is dirty and not well maintained, especially because there are many stray dogs and different establishments where you can eat under umbrellas where people throw plastic and garbage directly on the floor. If you want to go for a swim, seats and umbrellas can be rented for 50 THB for 3-4 hours a day. Get ready to be (almost) the only foreigner in a bathing suit. Sunbathing and swimming at the beach aren’t preferred activities for Thais, who when they see a foreigner at the beach, especially in little places like Cha Am, will immediately come up to you to find out who you are. The beach activities available are jet skis or the banana boat. For the first option be very careful because the ones who offer you the rental will try to rip you off, saying that you wrecked the motor and asking for money to fix it. The price for a 30 minute ride on a jet ski is about 1,000 THB. Another very popular activity in Thailand is horseback riding on the beach. You’ll see several people ride by on horses and will be asked if you want to take a ride too for a price starting at 600 THB, though that’s negotiable. The places worth seeing in my opinion are those on the outskirts of town. 8 kilometers from the beach in Cha Am, for example, there’s Santorini Park. This Greek-themed park, as the name suggests, covers an area of more than 3,000 square meters. Inside you’ll find replicas of typical homes on the Greek island of Santorini housing restaurants and various shops like food, souvenirs, and even name-brand stores like Adidas and Nike. You can also stay inside the park thanks to the rooms available at the Santorini Park Stay Resort. Hours of operation are from 10:00 a.m. to 7:00 p.m. from Monday to Friday, and from 9:00 a.m. to 7:00 p.m. on weekends. Entrance costs 50 THB for residents, and 150 for non-residents, plus 120 THB for each attraction you want to ride (an example is the Ferris Wheel). Next to Santorini Park is its aquatic version: il Santorini Waterventures Park. This park is dedicated for fun in the water like water slides and artificial wave pools. Entrance costs 900 THB, though if you buy tickets online on their official site, you can save 200 THB. You can get to Santorini Park and Waterventures on a Bangkok-bound bus, since the park is on the main road that the bus takes to get to the capital, and therefore one of the stops is Santorini. Or you can take a taxi from the center of Cha Am. If instead you’d rather be in the middle of nature, then I recommend that you visit Kaeng Krachan National Park, the largest natural reserve in Thailand. This park is located at the border with Myanmar, and covers an area of almost 3,000 square kilometers. In 2005 it was also recommended to UNESCO for consideration as a World Heritage Site. Inside you can find many species of animals, among which are 400 varieties of birds like the Red-black Large-beak, and some sixty rare mammals; like the Asian Elephant. Park activities include trekking (the highest mountain in the park reaches a height of 1,500 meters), canoeing, swimming in an artificial lake, taking a dip in the waterfalls, or just enjoy nature. The park is open between November and July. You can also stay inside the park in two areas designed as campgrounds. The camping area also has hours to be respected: 5:30-7:30 in the morning, and from 13:00 to 15:00 in the afternoon. The areas where you stay in tents require a supplemental price of 30 THB a night. For the youngest tourists you can also visit the Swiss Sheep Farm. This replica of a Swiss farm is located 9 kilometers from Cha Am, on the same road as Santorini Park (Phetkasem Road). Opened five years ago, inside you can find animals of various types like sheep and goats. It’s a place best suited for kids; the main attraction is feeding the animals. Hours of operation are from 10:00 a.m. to 7:00 p.m., every day, and entrance costs 50 THB for adults and 30 THB for children. Personally I don’t consider Cha Am a place that’s worth the trouble visiting, especially of you have limited time in Thailand and have to take a 20 hour flight from Europe. 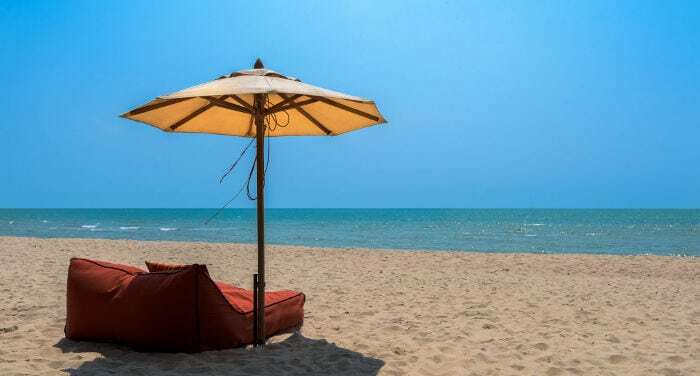 But if you’re looking for a beach destination not too far from Bangkok, easily reachable by bus, that’s more peaceful than Pattaya, then I recommend that you go to Hua Hin. Compared to Cha Am it’s much bigger, and offers much more appealing beaches.